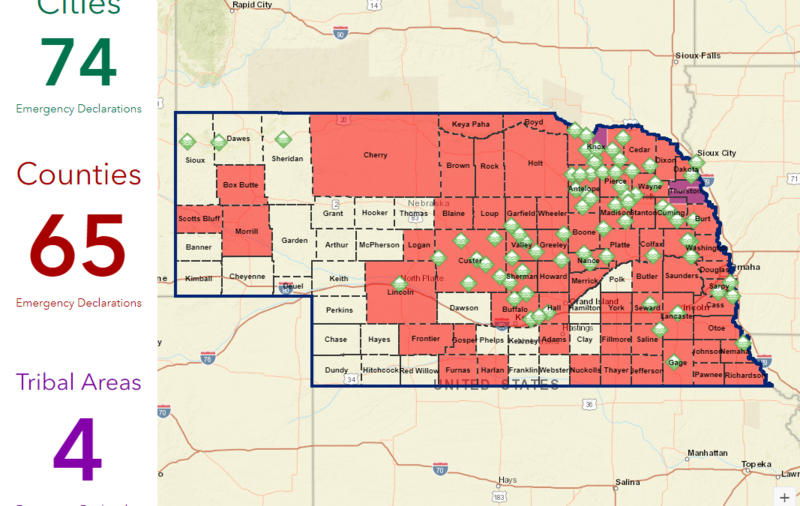 The Nebraska Emergency Management Agency (NEMA) continues to work with multiple public and private partners to serve those affected by the floods in Nebraska. Information as of 6:00 pm CT 3/18/19. Nebraska State Patrol: Over the last 24 hours, the Nebraska State Patrol, working with the Nebraska National Guard and the Nebraska Department of Transportation, led three convoys of semi-tractor/trailers and fuel tankers from the Omaha area to Fremont, Nebraska. The first convoy left Omaha on Sunday at 5:30 p.m. and arrived in Fremont two hours later. Today, a faster route was created by NDOT that’s allowed two more convoys of trucks, including one with 17 semis full of supplies, to make the journey. Donations: The Nebraska Preparedness Partnership is currently accepting donations. These donations will stay in Nebraska and will be used for these catastrophic flooding/blizzards. Call Sandra Hobson at 402-979-7207 or email her at shobson@neprep.org for more information.